We live in a culture that trains us from an early age, perhaps from birth itself, to disconnect from our Self. We are given the lessons over and over to disconnect from our body, to hate her, to never be satisfied with her, to not listen to her, to not feel good in her. We are given lessons to disconnect from our spirit, our intuition and our inner knowing and truth. We soak in and believe these stories and repeat them over and over in our minds of how we aren’t enough, how we don’t matter, how we are too much, how we should feel shame in everything we do, everything we are, in existing at all. This is what a patriarchal culture teaches us. It is how it trains us. It is how it feeds itself. By keeping us small. Obedient. Docile. And completely disconnected from who we are, what we are, how we are. Our culture teaches us to be afraid of our power and the power of other women. While we are disconnected from our own Self we are also sitting in isolation, fearful and judgemental of other women. Especially women who dare to stand in their own light and power. Especially women who dare to show the world their strength. Especially women who allow other women to be who and where they are and who embrace their sisters, flaws and imperfections and all. We are taught to compete. Over and over. To strive. To “better ourselves.” To catch up with Ms. Jones. To seek “perfection” and “balance” (whatever the hell those words mean). We are told in a million ways every day how we don’t measure up, how we need to do and be “better,” how we fail and fail and fail some more and how if we only tried a little harder (whatever that means) we would be perfect and successful and loved. We are taught we can’t possibly be loved for who we are, as we are, right now, with all these flaws and deficits and too muchness. We are taught we aren’t deserving of love. We are taught we aren’t deserving of anything. We listen to these outside voices that also live within our bodies. These voices are in our bodies because we internalized them, our mothers internalized them, our grandmothers internalized, and so on throughout our family tree. These voices are in our bodies because of trauma and fear and needing to find a way to survive. And these voices are in our bodies because we haven’t kicked them out. How do we kick them out? By beginning to connect to our true inner voice. By connecting to our body and all her knowing and wisdom. By connecting to our body and soothing her fears and anxiety. By connecting to our body and healing the trauma and pain and wounds of our past, of our lived experience, and the experiences of the women who came before us. These are not easy tasks. It takes time, work and dedication. It requires curiosity and commitment. It will require connecting to emotions we have been told are bad and that we need to avoid at all costs. Rage. Grief. Pride in who we are. It will require learning to have compassion for ourselves and others. It will require us opening to love, true unconditional and accepting love. It will require tearing off scabs and cleaning out old wounds, giving them air to breathe and salve to heal into more connected ways of being. It will require work our culture does not want us to do. Discourages us from doing. Can’t allow us to do if it is to continue to thrive. We can hear our own whisperings beneath the roar of the voices our culture uses. We can hear the quiet and loud call to find out who we are. We feel the desperate need and wanton craving to connect fully to the women we are, to our body, to our unfettered mind, to our spirit, to our soul. So, we begin. Slowly connecting to the women we are. Slowly connecting to other women who have learned to stand in their light. Slowly finding our people and our way. And slowly and quickly, those other voices become more dull, more muddled and our own true voice becomes clearer, more pronounced. We know change is coming. We know transformation is waiting for us. For all the women who came before us. For our world. Together we will tear off the leashes of our patriarchal culture and we will stand firm and proud in who we are, how we are, what we are. And this culture will try to pull us back down, but it will be too late. 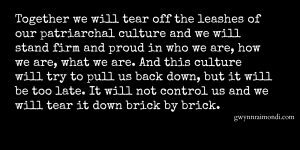 It will not control us and we will tear it down brick by brick. This is the power of connecting to our Self. This is the power of connecting to our Body. Of taking ownership of our body and being and soul, again. And as we do this work, we will be burning it all down and building anew from the ashes and rubble a world where we are no longer ashamed of existing. I talk more about this concept of being disconnected from our self and the shame our culture feeds us even more in this video below. It’s about twenty minutes long, so go ahead and get yourself a cup of tea or a glass of wine and settle in. This blog post and video were part of a series to introduce my 12-month circle Wild Woman Within :: (Re)Connecting to our forgotten knowing. This circle has grown into the 6-month circle Becoming Unleashed. To learn more you can go here.